The reason? 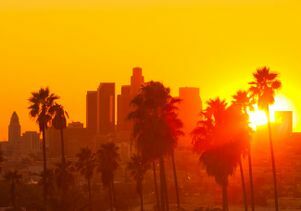 Los Angeles has finally achieved the gold standard of sustainability. Thanks to game-changing technologies, new policies and efficiencies, the city has become completely self-sufficient and sustainable in energy and water. It’s producing all the energy it requires locally with renewable sources, and it’s relying exclusively on local water supply. That, in a nutshell, sums up the objective of UCLA’s inaugural Grand Challenge project, “Thriving in a Hotter L.A.” It’s one of six UCLA-led projects, based on an informal count, competing for a share of $1 million in funding offered by the Goldhirsh Foundation through its LA 2050 Grants Challenge. The foundation is distributing money in five categories to help make Los Angeles the best place to play, to connect, to live, create and learn by 2050. Mapping L.A. Air Pollution (entered in the “Live” category). All of Us at UCLA: Revitalization of Mental Health (Learn). Through the Undergraduate Students Association Council Office of the President and the Student Wellness Commission, a core team of student leaders is organizing to bring mental health to the forefront of the L.A. community. Among various goals, students plan to host a mental health conference with workshops and open caucuses where discussions can take place. Making Los Angeles the most technologically progressive and healthy city in the country (Live). UCLA Advance Heart Failure and various academic departments in the UCLA College, the Henry Samueli School of Engineering and Applied Science, and the David Geffen School of Medicine would develop an app so that residents can access information dedicated to their well-being — including programs on eating, health, life and fitness — with their smartphones, tablets and computers. Sensors placed around the city would supply live data on air quality and toxin levels. Residents would become much more aware of their daily dietary, fitness and health habits and receive recommendations on how they can improve as well as incentives. Trail City LA: Connecting the city through a community-authored network of digitally enabled trails (Connect). Building on the success of its project at the Los Angeles State Historic Park, UCLA’s Interpretive Media Lab would build a web-based trail creation tool that could be used by community organizations and interest groups. The tool would enable them to design trails and construct meaningful urban walking experiences as well as interconnect their trails with those built by others. The UCLA Extension Landscape Architecture Program is proposing to turn the Expo line that will connect downtown L.A. and Santa Monica into a self-guided safari so that passengers can be more aware of nature and urban animal life that exist along this route, which follows the path of the underground braided riverbed of Ballona Creek. The Los Angeles County Natural History Museum and science teachers could help in the creation of field guides containing information and images of all the animals and habitat that exist along the route. Citizen scientists would be able to record their discoveries in these guides through a Facebook page. Of the 267 proposals that were submitted to the foundation, approximately 47 projects have some connection to UCLA. Ten winners will be chosen to receive $100,000 each to move their visionary proposals closer to fruition. “Individual submissions by UCLA teams reflect the campus commitment to research and other programs that serve local communities and aim to make Los Angeles the best place to live, work, play, connect and create,” said Assistant Vice Chancellor for Research Michelle Popowitz, who is executive director of UCLA Grand Challenges. There are two ways to win grant funding. Five winners — one from each of the five categories — will be chosen by popular vote online. Voting began noon Tuesday, Sept. 2, and ends noon Sept. 16. Five others — one from each category — will be chosen by a jury convened by the Goldhirsh Foundation based on the proposals' impact on the LA2050 goal, creativity and innovation, feasibility and collaborative spirit. “This is a whole new world for us in the Office of the Vice Chancellor for Research,” according to Popowitz. To elicit votes and gain more attention for “Thriving in a Hotter L.A.,” her staff has ramped up social media efforts. Beginning this week, the Grand Challenge campaign for votes hits Bruin Walk where passersby can learn more about the campuswide initiative, the #HotterLA project, and meet some of the staff and students involved. While the funding would be invaluable in helping the project pay for essential strategic needs not covered by research grants such as strengthening partnerships with off-campus collaborators, taking part in the L.A. 2050 Grants Challenge also gives UCLA an opportunity to share this vision for a 100 percent sustainable L.A. with the public, Popowitz said. “The project is incredible, but, so far, we haven’t focused on getting a lot of attention for it off campus. This is our chance to share our initiative and this first Grand Challenge project with the people of greater Los Angeles and to find partners whose aspirations are aligned with ours,” she said. Last year, the UCLA Hammer Museum, which submitted its proposal for “Arts ReSTORE LA: Westwood” in the same Goldhirsh Foundation competition, won a $100,000 grant from a field of 279 entries. The museum-led initiative, which took place last November, invited a select group of local artisans, craftspeople and performers to set up pop-up boutiques and venues in vacant retail stores in the village and created a buzz in the city. “Our point was to demonstrate a successful strategy for neighborhood and retail-space revitalization and to show how the arts can play a role in that,” said Christine Lanoie, UCLA’s director of development for corporate, foundation and research relations. Currently on the Grand Challenge project team, she worked on the Hammer proposal when she was associate director of institutional giving at the museum. To vote for any of the proposals listed above, click on the title. Before you can vote, you’ll need to have a GOOD account. You'll be prompted to sign up after you click the "vote" button for your pick. It’s free to join. You’ll need an email address or Facebook account to register. You will be emailed a link that you need to click in order to validate your address. You may vote for one proposal in each of the five categories during the 13-day voting cycle.